Shame on me, but I never tried a product from Kielh’s and I also never visited one of their store… And I always head such an amazing things about kiehl’s but… I never gave the products a chance to try out. But luckily has this changed! Because in January, yes I know this is so long ago but I wanted to be sure to test out this serum long and good enough to share my opinion…. So in January I went to the kiehl’s event, and they gave me the “‘powerful-strength-line-reducing concentrate” to try out. And yes, this is a long name for a product, but with other words is this a serum with vitamin C. I already tried a product with vitamin C but then from vichy and this was more a cure. So are you curious what I think from this serum or with other words how my first test out from a kiehl’s product went? It’s my first experience with Kiehl’s, but I think that the packing looks good and clean! Also I love that this works with a pumping system because this is very hygienic! And this product look a lot like the nice products from way way back that you could buy by the pharmacy. Do you know what I mean? Because it’s hard to explain because I wasn’t born than… And I think that the most of you also weren’t born yet! But good, I love how this product looks! What makes this serum so special? This serum is a remake from the first version but than with more Vitamin C, namely 12,5% (10,5% L-Ascorbic Acid and 2% Ascorbyl Glucoside) and the serum also contains Hyaluronic Acid. The serum promise to reduced the visibly from fine lines and wrinkles. But that is not everything, because it also must make the skin smoother and more radiant. How good works this vitamin C boost? This serum has a greasy structure but it easy and quick absorbs into the skin. It smells of course a bit citrus like, but very subtle so the smell is not to predominant. I always use this in the morning after I washed my face and before I put on my day cream. I could test this serum out for a while now, and the results are surprising good! My skin feels and looks just amazing! It also looks much smoother and my acne scars look much better now! Yaay! I don’t have much wrinkles yet, but I’ve got some dry lines. And it indeed is true that the lines are visible reduced . So hell yes, this serum is a really top boost for your skin! If you wanna try out the lovely structure from this serum you can experience it in the Kiehl’s stores. In Belgium they have a store in Ghent, 2 in Antwerp and 3 in Brussels. You need to try this serum for sure, because it really works as an amazing boost for your skin! 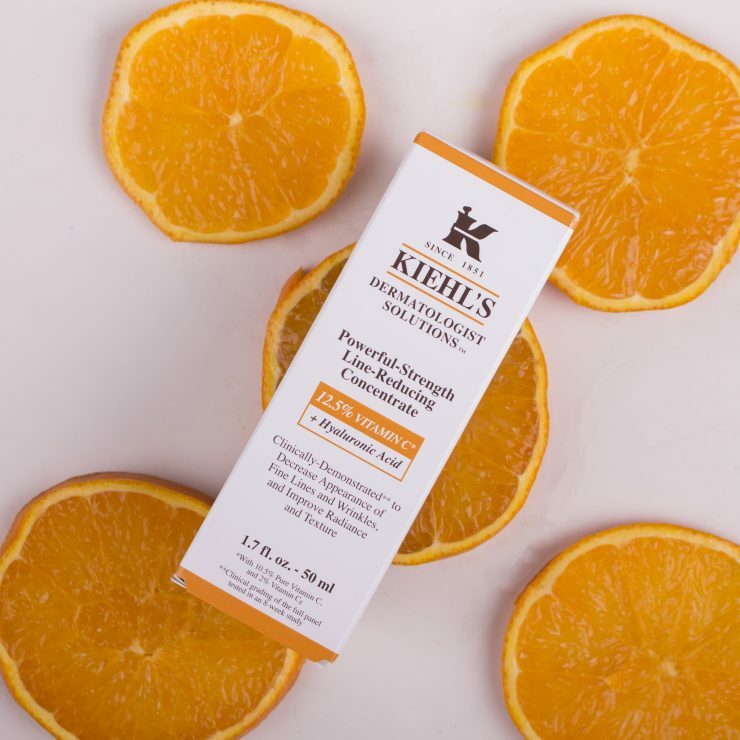 This serum is a real favorite from me, so my first experience with Kiehl’s is directly a good one! The price from this “Powerful-Strength Line-Reducing Concentrate” serum is €59 (50ml), €78,50 (75ml) & €97 (100ml). Oh, and did you know that you can buy the kiehl’s products also online at there official webshop? I didn’t know, so if there isn’t a store nearby you can always order something at the webshop! Klinkt als een fijne boost voor je huid! Wel aan de prijs het product. Ja, klopt het is wel prijzig… Maar het is echt wel een geweldig product voor je huid.